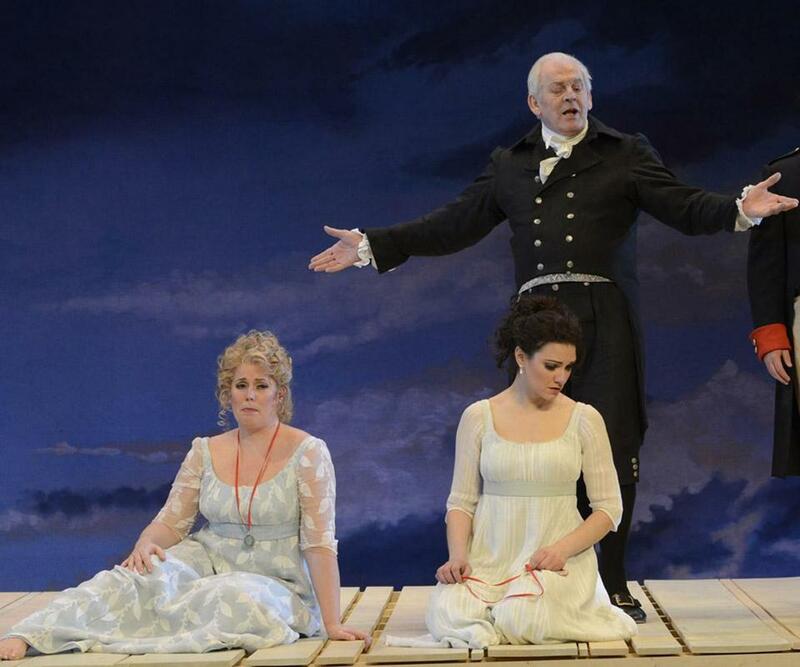 Boston Lyric Opera’s production of “Così fan tutte” at the Citi Shubert Theatre stars (from left) Caroline Worra, Sandra Piques Eddy, Thomas Allen (who also directs), Paul Appleby, Matthew Worth, and Phyllis Pancella. If there’s a foreign-language opera you’d be happy to hear done in English, it might well be Mozart’s “Così fan tutte.” There’s a lot of rapid, sometimes simultaneous, conversation that would strain the limits of supertitles, and you don’t want to be distracted when you’re following the action, where body language counts for as much as vocal inflection. The English-language production from Boston Lyric Opera that opened Friday at the Citi Shubert Theatre is bright, broad, and breezy. It might not sound the composer’s emotional depths, but it’s well sung and very enjoyable. Set in Naples, and taking its title from a line in Mozart’s earlier opera “The Marriage of Figaro,” “Così fan tutte” — which translates as “All women are like that” — is the story of a pair of soldiers smitten with a pair of sisters: Guglielmo with Fiordiligi, Ferrando with Dorabella. When old cynic Don Alfonso challenges our heroes to test their beloveds’ fidelity, Guglielmo and Ferrando pretend to have been ordered away to fight but instead disguise themselves as wealthy Albanians and woo the sisters — with distressing results: Dorabella falls for Guglielmo, and Fiordiligi for Ferrando. The opera can be read as a slander on womanhood, and in the 19th century it was not popular. But it’s neither that simple nor that sexist. Don Alfonso and his accomplice, the sisters’ maid, Despina, must go to great lengths to induce the ladies to give way. Guglielmo and Ferrando are largely interchangeable; at the end, it hardly seems to matter who winds up with whom. And, really, had it been the sisters who conceived the fidelity test, would their men have fared better? This production, discreetly cut, whizzes by in three hours with one intermission. It’s directed by renowned British baritone Thomas Allen, who also sings Don Alfonso, and does full justice to it. There’s no meanness in Allen’s mischievous codger, who presides over a beach romp that takes place along the Bay of Naples, in Napoleonic times, with real sand for the mostly barefoot lovers to walk on, and a gently raked boardwalk. Sandra Piques Eddy’s Dorabella is the most particularized of the four lovers, and also the most hilarious, as when she shakes out her hair and turns “O cease to torment me” into a mock-tragic-heroine aria. Caroline Worra’s Fiordiligi is a study in high dudgeon and outraged propriety; Matthew Worth’s Guglielmo and Paul Appleby’s Ferrando are obtusely confident at first, then racked by conflict as each falls in love with the wrong woman. Vocal highlights abound: Appleby’s gentle, swelling “From eyes so alluring,” Worra’s piteous “Ah, my love, I pray forgive me,” Worth and Eddy in their love duet, “This heart I give you.” Phyllis Pancella’s put-upon Despina is funny when she pours sand out of her shoe and funnier still when essaying a variety of outrageous accents in disguise as a doctor and a notary. There are supertitles for the arias but not for the recitative. Enunciation is good; if not every line is intelligible, the singers’ movements convey the message. The translation by Marmaduke E. Browne, as revised by John Cox, is free and colloquial; Guglielmo’s “No longer reject us, come here and inspect us” is actually snappier than the original. The orchestra under BLO music director David Angus runs the gamut of appropriate moods, with wistful winds in the overture and ferocious Baroque timpani from Craig McNutt.